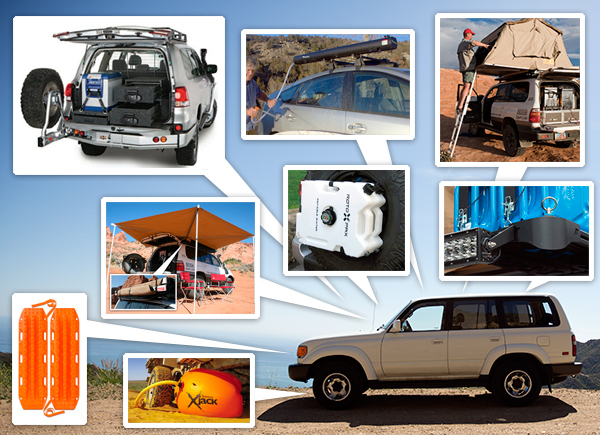 While this is in no way an extensive list of options, here’s a look at some of the more ingenious designs encountered while researching the world of Overlanding as we work on The NOTFZJ80 Project. As a starting point, i’ve kept this list restricted to car specific products (versus tables, chairs, stoves, and other camping gear). 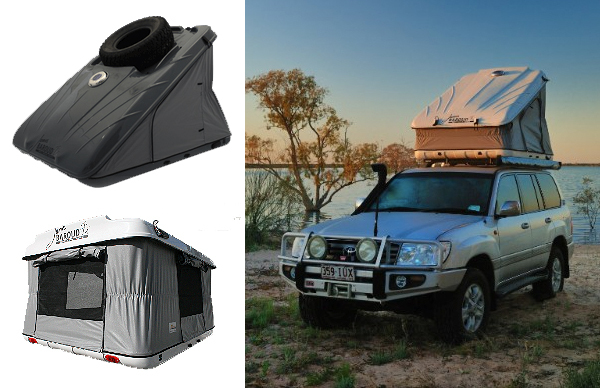 ROOF TOP TENTS - I knew about car camping, but until now i hadn’t looked into the idea of tents on top of cars! Fascinating is how many of them pop open, where the ladders go, that you can have a full mattress and even stash your sleeping stuff inside them! Here’s the Eezi-Awn Series 3 1600 Roof Top Tent. 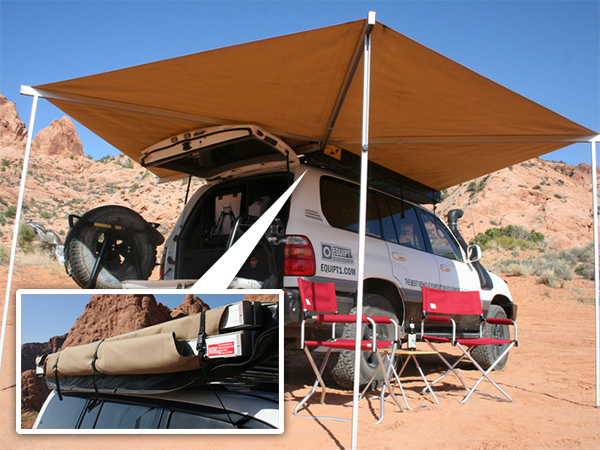 Another option, if not going for the soft topped tents is the James Baroud hard top tents that basically pop open. … another noteworthy option is the hardtop Maggiolina - which even comes in a carbon fiber version. AWNINGS - i’m fascinated that this Eezi-Awn Bat 270 Degree Awning is strapped to your roof rack and opens up a full 270 degrees to cover the side and rear of the vehicle! Within moments you have an instant camp site shaded… and your tent can still fit on top. 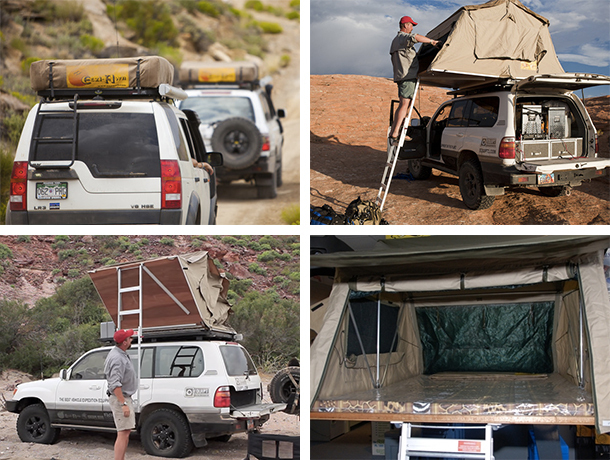 … another option is the Oz Tent Foxwing Awning. RACKS AND MOUNTS - A good foundation to attach everything to is key… one of the most unique, modular options we found are LabRak, based in Oregon. (Side note: i have a soft spot for their logo with the labrador retriever integrated in the R!) What I love about their racks for the FZJ80 are that the rain gutter mounts don’t require drilling through the gutters, and are just as strong if not stronger. 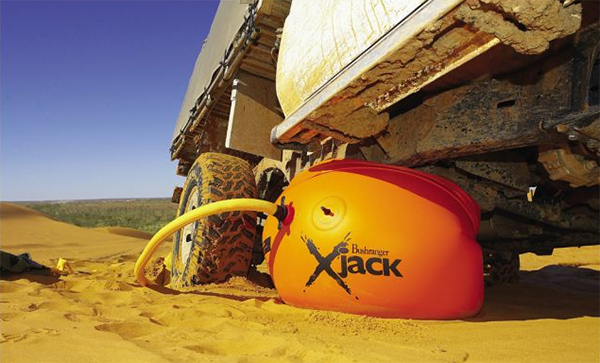 JERRY CANS - it’s no surprise that when you’re adventuring far into the woods, the most important resources to carry with you (besides food) are gas and water. On fun design details - the jerry cans from Rotopax that can be mounted/attached through the center hole caught my eye. These can also interlock when laid flat. SHOWERS - As far as expedition showering, the vehicle aspect of Overlanding provides interesting opportunities, like the unique Road Shower. 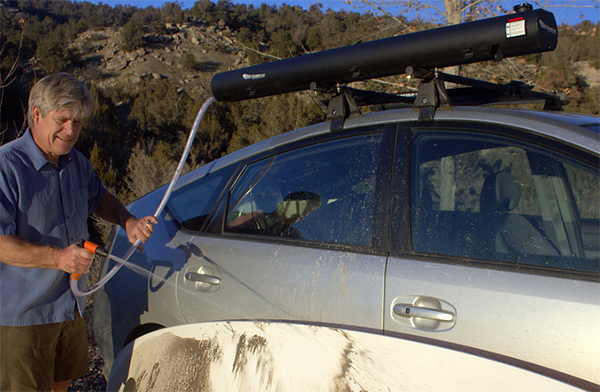 Strapping this large extruded aluminum tube to your roof rack, you can easily fill it with water, let the sun warm it, and pressurize it (with a hand pump or air compressor) to have a nice warm, pressurized shower or way to clean off your gear. The history of the Road Shower design evolution is fascinating. 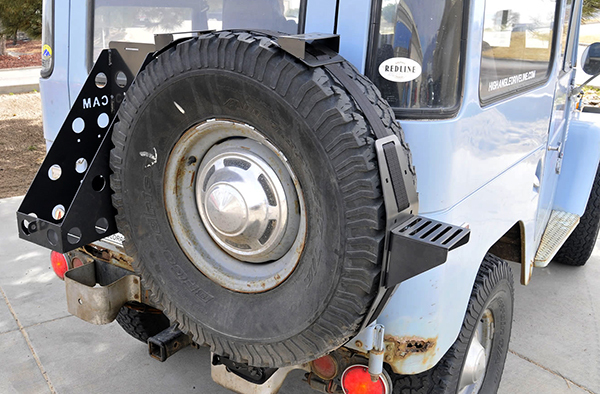 SPARE TIRE USES - When offroading, the last thing you want is a spare tire attached to the bottom of the vehicle being crunched on rocks and dragged through the madness… so odds are your spare will end up on the back of the vehicle. Not to waste the space, here are some options of surprising ways to use your spare besides simply bolting in racks that sandwich your tire. The Trasharoo is a HUGE backpack that fits your spare tire and can be used for anything you need - from muddy gear and wetsuits to trash and more. If needed, you can also wear it as a monstrous backpack for you. With the molle straps, you can even add pouches, clip accessories, or even add the license plate holder. 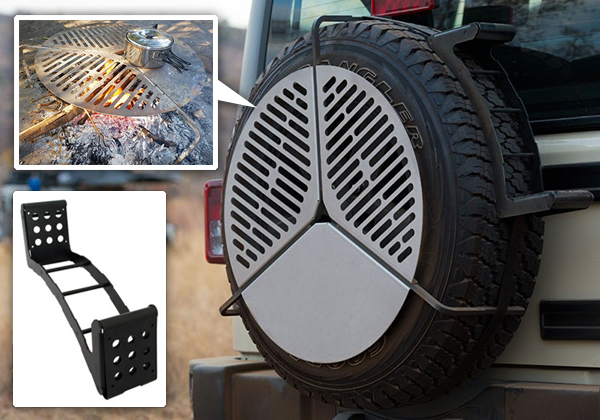 You can even add a Front Runner Spare Tire Mount Braai BBQ Grate as well as this Front Runner Spare Wheel Step as an alternative to a ladder. Though, keep in mind that if you end up using the spare, your step may not be so helpful. For all in one strapped around your tire, the Redline Cruiser’s CAM R.U.T. 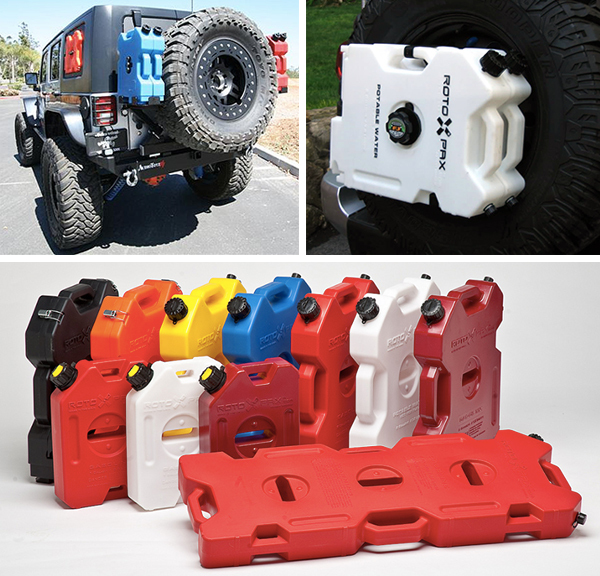 Spare Tire Accessories Mounting System is another option. GETTING UNSTUCK - since offroading can lead to getting stuck in all kinds of places… here are a few brilliant ways to get unstuck! First MAXTRAX, toss them under your wheels to get some traction. 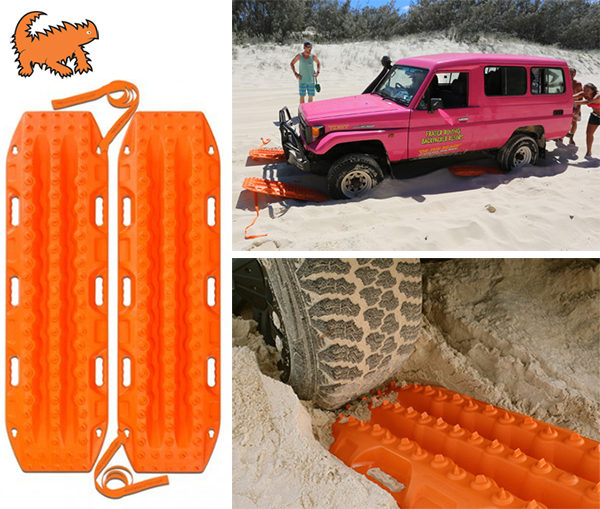 While their signature orange does look like those baywatch lifeguard floaties, it does stand out in the mud, and they are available in a few other colors as well. On unique ways to jack your car up… use your exhaust! 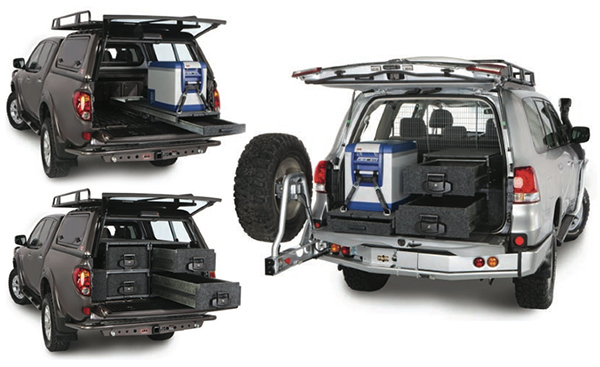 Here’s the ARB Bushranger X-Jack. It has a lifting capacity of 4000kg and provides up to 75cm of vehicle lift. 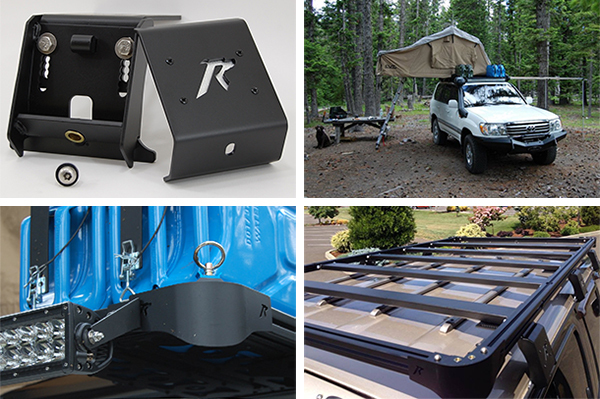 And these are just some of the basics… we haven’t even begun to dive into the various bumpers, grills/stoves, power/battery systems, lighting, tables, chairs, organizational setups, first aid kits, roof rack mount attachments, and more… any suggestions?